This weekend has been a little rough for me. Between having a teething baby who doesn't want me to put him down and having another hot weekend of 110 degree days, I was completely stumped as to how to dress cute. That's why I decided to draw some inspiration from a couple of my favorite actresses style. 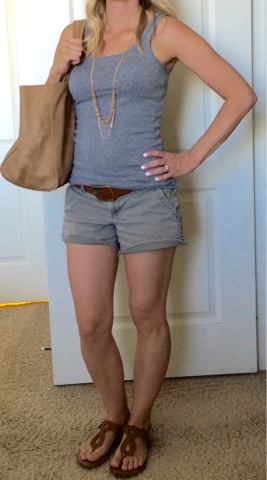 On Saturday, I was inspired by this simple shorts and tank top look that Jennifer Aniston wore. I like that it's comfortable in the heat and doesn't take much to recreate. 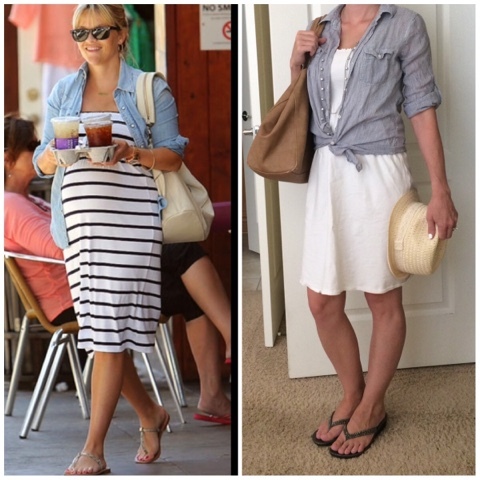 On Sunday, I planned on having some pool time to cool off, so I found this casual look that Reese Witherspoon wore while she was pregnant. I liked the simple dress with a button down shirts it over it. Those are my weekend looks! Hopefully these looks can give you some simple ideas for how to dress in the hot weather. You can find more Jennifer Aniston and Reese Witherspoon looks for less here and here in my Celebrity Looks for Less posts.